Kevin did a video post about this the other day and if you listened to From the Rafters Radio on Thursday, there was a round table discussion on the topic. I didn’t get to partake in that group discussion due to work commitments and when asked later if I had anything to add, I declined. I passed on making any comments due to the show being towards the end and they had already talked for around 30 minutes on the subject so I didn’t feel the need to add more time to the discussion. After the show I got to thinking about it and realized I did have something to say on the subject. Thankfully I have this blog to use as a way to get my thoughts out there. At the bare basic of the idea of stereotypes in wrestling, I think the evil foreigner, the dimwitted baby face, etc. is the result of lazy character development. If a character can be defined in one sentence, then there’s probably not a lot to the character. When a character is barely one-dimensional the shelf life isn’t going to last too long. There are probably some examples, which would disprove this theory, but I don’t feel like racking my brain trying to think of an example. The big chunk of the discussion and Kevin’s video was the use of gay characters in wrestling. 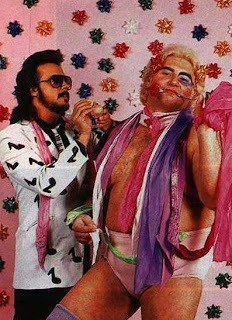 It was brought up that most wrestlers who have had a blatant or borderline homosexual personality have been presented as bad guys. One of the major points of debate was could a gay wrestler be a face and would the fans get behind (maybe that’s not the right phrasing) him? I think there will be a gay wrestler on the national level who is a face within the next few years. However, there’s a catch. While the public perception seems to be transitioning to be more tolerant of homosexuality, I don’t think a full-blown gay character will be accepted. I look at it like this, most people don’t have any issues with a gay male if they don’t know he’s gay or if they know he’s gay but isn’t overly feminine. If Gay Wrestler comes out looking like every other wrestler, even if he tells the fans he’s gay, and if he hugs guys instead of girls on the way to the ring, fans would cheer him. Assuming he had personality and can be entertaining in the ring. BUT if Gay Wrestler comes out in Shawn Michaels referee style booty shorts and being for lack of a better term, obnoxiously gay, I think the crowd would boo and/or be offended. As I was thinking about this, I remembered Chris Kanyon. Kanyon had a moderately successful wrestling career in the late ‘90s/early 2000s before briefly retiring in 2004. In 2006, Kanyon publicly announced he was gay. Granted few, if any, fans knew Kanyon was gay while he was wrestling but I don’t remember any backlash towards him because he was gay after he made the announcement. There was some backlash due to the way Kanyon tried to present himself as the first openly gay wrestler. When Orlando Jordan was in WWE, even when there were rumors of his sexuality floating around the internet, there wasn’t any backlash towards him as a wrestler. When he showed up in TNA and was squirting lotion on his chest and being overtly sexual there was an outcry of protests. I don’t feel it was because Orlando was bi-sexual. I think it was more due to the stories weren’t good and the wrestling was even worse. Some may feel my reasoning shows wrestling fans won’t really accept a gay wrestler because they’ll say if the wrestler can’t really be flamboyantly gay then he isn’t really a “gay” wrestler. Maybe I’m wrong, but as I said earlier, I don’t think it’s so much a wrestler’s sexual preference as much as it is the presentation. Much of the population is okay with homosexuals as long as they don’t have to be subjected to it. I feel the same way towards heterosexual guys who try to brag about how many women they’ve bedded. That aspect of a person’s life doesn’t need to be on public display. Have I made sense? What do you think? Share your thoughts on Facebook or Twitter. Only request is to keep your comments civil.